SuperFogeys - 455 – You’re Not My Father! 455 – You’re Not My Father! 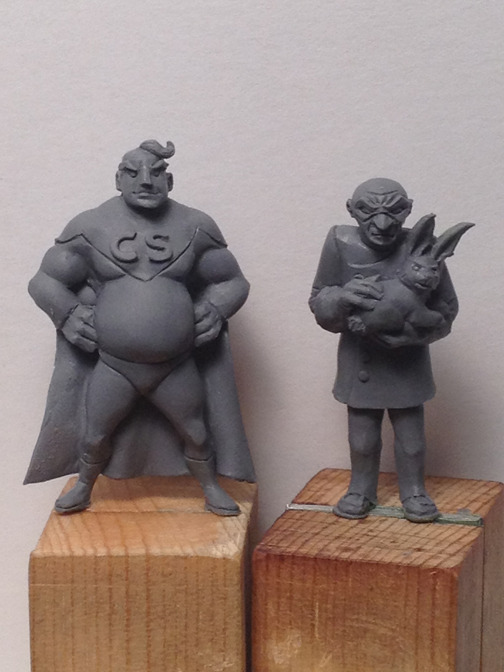 HUGE update to the SuperFogeys Kickstarter over the weekend–including your first look at the miniatures for Captain Spectacular and Dr. Rocket! Here’s my blog with all the details. Doc Roc had time to see that it was an alien setting them free and even recognize the species if he really wanted to. I’m thinking he made a cache of anti-alien weapons while he was there or an alien proof bunker or something. On an artistic note, I love the fact the lightning is Doc-and-rabbit shaped. But Tom and Captain Spectacular have the same DNA. It’s a web comic based on comic books. Is Tom Cap’s son or his clone? Spike, I second that on the art! gnrrg- holy crap, you’re right! His DNA shouldn’t have matched Cap’s! It shoulda been partial! …unless the alien DNA scanner whatsit has different tracking abilities than we’d expect… Dammit. I think the genetics questions is simply something used for the sake of story telling. We’ll have to overlook it. How great are those sculpts! Big kudos to sculptor Gene Van Horne for capturing ALL the detail of what up until now was just drawings on a screen. I can’t tell you how amazing it is to see these guys come to life. With Harvey! As of this writing, we just cleared 50% of the initial goal, so we’re well on our way to achieving some of the stretch goals. Spy Gal is the next figure up–but only if we can hit our next goal. After that? Well, we’ll do everybody if we can. It’s all up to you. Some new reward levels were also added over the weekend. Want just the two initial figures and a pdf version of the book? Then you can be an Eco Hero for just $15 bucks. Want to get everything available so far and create a hero or villain with me who can be not only in the book, but is guaranteed to show up in at least two strips? Then you might want to consider the Interstellar Hero and Unrivaled Villain levels. Also, by the time you read this there should be some NEW reward levels up that will nab you sketch cards and inked drawings by yours truly. Since I’m not exactly drawing SF anymore these days, this art will be very rare indeed. UPDATE – They’re there now! Again, rewards are EXTREMELY limited. We’ve already sold out of a few of them! Act fast, if you can. Much more to come. Keep your eye and on the SuperFogeys Kickstarter and leave a comment to make requests. Big thanks to everyone who has contributed so far!